My Maverick recruiter called me today and said they are going to start requiring a two year contract to go through their school. I'm considering going to a school here on my own now. I'm hoping I really like flatbed and don't plan on quitting but I'm just not sure about a two year commitment. I don't live far from you (Warrensburg,MO) I have been approved with Maverick to go through there CDL sponsored school in April. I don't retire from my current career until then. I have a question about transferring the CDL. The way I understand it is you get your permit and then CDL in Arkansas and then you come back to Missouri and transfer it back so you have a Missouri CDL. Do you have to retake any tests or the CDL physical to get the license transferred back to Missouri? Due to an acute family health issue, I resigned from CFI to stay much closer to my home area. I'll be starting with West Side Transport in a matter of days, as soon as CFI stops dragging their feet and sends my diploma to me. Paying my tuition balance was not an issue. Since I resigned from CFI and turned in my truck, I will not be posting in this thread any longer. If someone asks me a question about CFI's training, I'll gladly answer when I can. Most of my energy will be focused on getting up to date with WST and dealing with the family situation. My Sister will be coming to Ohio, so that will definitely be a huge help to me. Unless I hear differently from West Side Transport, I will be starting orientation on 9/10. It will be interesting to see how I do on a manual the first day and how quickly I can catch on. In the future, I may post about my daily 'goings-on' with WST. Wait. What? You quit CFI? What happened? Didn't you go through their sponsored school? Won't you have to pay them back for the school now? I understand completely, I hope all goes well for you and your family. Should I choose a company that trains on automatic transmissions and have that restriction on my CDL? Just finished out monthly conference call where we get to hear all the great things CFI is doing and get to ask questions of our company president as well as heads of other departments. CFI has no plans to faze out training on manual transmissions in the schools. The fleet only has a few manuals left. Don't believe every rumer you hear. I just got off the phone with a CFI recruiter named Courtney. Courtney said their school is now 3 weeks instead of four and you WILL have an automatic transmission restriction on your license. I don't think CFI is doing that. I'll try to remember to try and ask that tomorrow. Yeah if you could check that would be great. The guy that told me that went through the CFI training At Crowder college. 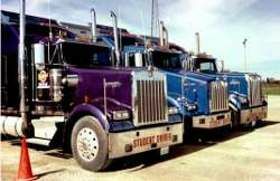 Apparently CFI and Prime CDL training programs are now testing their students out on automatic transmission trucks since they are going all auto so the new drivers that go through their training will have that restriction on there license. Would you experienced drivers consider this a deal breaker if you were just now coming into the industry. I know a lot of companies are going all Auto. I was considering CFI because of there school in Springfield,MO but now I don't know. Hey Jeremy I reread your post and realized you are looking for companies that offer CDL schools. The companies I mentioned require you to attend a school on your own but they will reimburse you for a year commitment. There are several schools in our area if you could swing it. State fair community college in Sedalia has A 160 hour CDL school for about $3500. That's the best price I've found so far. Curious if anyone knows of any companies that offer a dry van Midwest regional. Home every weekend or every other weekend for at least a 34 hour reset. I will need CDL training. I do have my Missouri permit and medical. I live in Pleasant Hill Missouri, about 30 miles South of Kansas City. I greatly appreciate it! You all stay safe out there. Hey Jeremy I'm not far from you in warrensburg. There are several companies that hire new drivers for Midwest regional. My top two choices so far are Schneider National, and Transland down in Springfield. Westside transport in Iowa also hired new drivers for Midwest regional I think. If you're interested in flatbed, Maverick and TMC are the way to go in our area. There are at least two TMC drivers here in warrensburg that I see parked every weekend. No need to go OTR any more if you don't want to. I'm about 9 months out until I retire and can finally start my next career as a truck driver. I started the high road training a couple days ago. Is that too soon do you think? Can it be reset so I can do it again when it gets closer to the time I take my permit test? I'm just anxious to get started. Larry, I'm not sure if that was just a quick response or a rude one. OS is a wealth of knowledge on here and is merely trying to ask some simple questions to make sure the OP doesn't potentially set himself up for failure. Now, if we want to get down to technical answers, I could write a book for this guy but there are plenty of factors involved. I can go on but you see my point. This is one area where I have a bit of knowledge since I used to build and work on the big boys for a living and still turn wrenches when I have to. Preference is all based on opinion. Sounds like you are very qualified to answer his question, so why not ask him those questions and help him in his research? His question was specifically what is the best equipment to invest in. Now if his question was "do you think I can make money as an Owner operator?" Then OS opinions would have been right on. Seems a lot of people come here for specific answers to their questions and all they get is lectures. A big question would be, what's your budget? Robert has a good question, budget may dictate the whole thing, but I have a little different angle on the question. Let's just say you had a budget of 100,000 dollars, or maybe even half that. Is that your ability to borrow, or is that extra cash you just have laying around with no good purpose? Now, what is your purpose for going owner operator? If your reason is "to make more money," then what evidence can you produce to support your belief that you will indeed make more money as an owner operator? We recently had one of our long time members in here who after a brief time as a company driver decided he wanted to make more money, so he became an owner operator. He was in here telling us how great it was going (and for the record, I personally think this guy has a great head on his shoulders, and he seems to be doing okay with it for now, but all honey moons are good if you know what I mean) He made the outrageous claim that he was making five or six times the amount he was as a company driver! Parrothead66, I've owned a good amount of trucks, I was in business for thirty years before I retired and started driving a truck as a company driver, and when it comes to business and making money, you can't blow smoke up my backside - I've experienced all the highs and lows of being an entrepreneur. I cried B.S. - as much as I didn't want to embarrass the gentleman, I knew there was no way he could be making that kind of killing. You want to know what the real disturbing thing about the whole discussion was? He really thought he was making that kind of money, but after asking him all the right questions, he had to admit that he was paying himself around five or six hundred a week - Do you know that a new driver in training at Prime makes more money than that? If your motivation is simply to make more money, then use that good head God put on your shoulders and ask yourself a few questions. One of which should be "Why is it that all these trucking companies are advertising that they are seeking to hire owner operators?" Do you seriously believe they are just wanting to find some people that they can pay a whole lot more money to for moving their freight? Here's another one for you. I think about this one everyday when I am in the truck stops. "Why is it that about twenty nine out of thirty owner operators I see out here in the trenches are in an old wore out truck (usually twenty plus years old) when they are supposedly making so much money that they need a wheel barrow to take the money to the bank each week? Now let's get back to Robert's very astute question. If you've got cash in the bank that you are just wanting to spend, then just keep doing whatever it was that enabled you to put that cash away like that. Trucking's risks are very high, and you are a beginner in the truest sense of the word. Why would you want to take those kind of risks at losing what some folks work a lifetime to put away for retirement? Do you know how to forecast business risks, losses, or profits? I do, and I can tell you that for owner operators, it all seems like roses at the beginning, but hold on to your steering wheel, because about three to five years into this game and your dream may become a nightmare of epic proportions. Okay, I've given my dire warning, and I'm sure some are laughing and ignoring it. I've gotten accustomed to the fact that everybody thinks I'm so wise until I start opening my mouth about the problems of truck ownership. Final word: it is my opinion that the risks associated with truck ownership far outweigh the possible rewards. There are, and have been a few, who have done well at it, but there are interstates paved with the tears of the many who tried it and suffered the uniquely predictable consequences. So to answer the original question....why don't you just say "I have no idea"
What fleet or fleets has primarily or all automatic transmissions? Just finished driving school and have no desire to drive a stick. Anyone else have knowledge of companies with Auto transmissions? Were you planning on doing local, otr, or MWR with them? I'll be MWR. What does MWR stand for? Those are DOT driving jobs. The OP was asking about failed drug test (ie, Walmart) prior to CDL in which no database exists. There is no such thing as a "failed drug test data base"
Don't say that too loud, some folks around here say that's just not possible. Congratulations! Sounds like you are doing great and enjoying it! Oh my friend you don't know truck drivers at all I'd say. They'd swim across the Atlantic just to say, "I told you so!" Heck, if I thought there was a ton of money in it I'd be doing it myself! Wouldn't we all? Im glad you consider me your friend. Wish I knew how to use those cute little avatars. My mistake I apologize. I read your post wrong. I at first thought you said you had 6 trucks. I missed you retiring from your manufacturing business. The trucks were a part of that? And just because you failed as an owner operator but have found success as a company driver doesn't mean it can't be done. Larry, where ever did you get the idea that I failed as an owner operator? You are reading this stuff with your own conclusions already established, and because of that it is no wonder you are completely missing the point of the discussion.